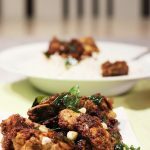 chicken ghee roast recipe – learn to make the best delicious chicken ghee roast. This chicken ghee roast recipe yields chunks that are soft, juicy, flavorful, delicious, spicy and hot. It pairs well with plain rice and tomato rasam or any vegetable side dish. Chicken is cooked till tender with all the masala and then ghee roasted with curry leaves and pepper powder. Curry leaves and pepper lend a great flavour to the chicken. This chicken ghee roast can be a good stand by to those who prepare in large quantity and refrigerate. Chicken can be cooked first with marination ingredients and then refrigerated. Whenever needed the next few days, it can be roasted in just 5 minutes. 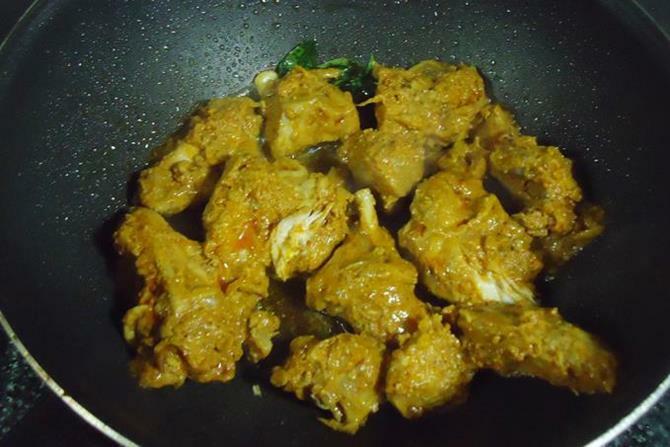 To make chicken ghee roast, left over good chicken curry can also be used. That’s how i end up making this most times.Just follow the step by step photos from step 2. Any curry that has been prepared with yogurt or tomatoes or lemon juice goes well to make this yummy chicken ghee roast. This chicken ghee roast recipe yields chunks that are soft, juicy, flavorful, delicious, spicy and hot. Wash chicken and drain off the water completely. To a cooking pot, add it along with the ingredients mentioned under to marinate. Mix everything well and cook on a low flame till the chickn is tender and cooked completely. If you find moisture in the pot, Cook on a slightly high flame and evaporate it. Set this aside for about 30 to 45 minutes. Heat a pan with ghee, Add chopped curry leaves and garlic. Fry until the curry leaves turn crisp. You can set aside few leaves for garnish. To the pan, add and begin to roast. When the masala gets roasted well, sprinkle pepper powder and salt if needed. 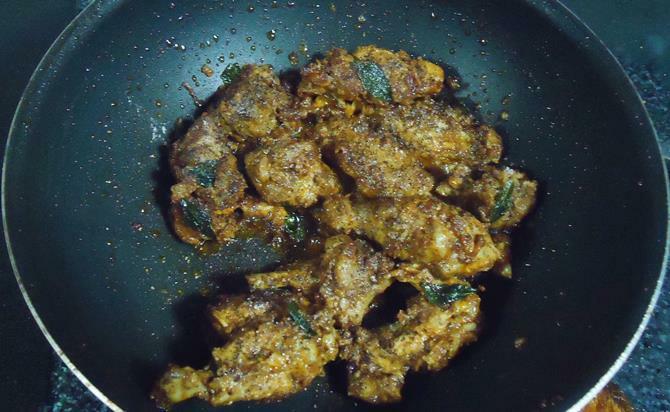 Fry till you get a nice an aroma of pepper chicken ghee roast. Switch off the flame. 1. You can skip this step if you are using any left over curry to make the ghee roast. or Marinate chicken with crushed onions, ginger garlic paste,salt, turmeric, red chili powder, lemon juice, garam masala, pudina or coriander leaves and ghee. Cook on a low flame till the meat is tender and soft.If there is surplus moisture left after cooking chicken, evaporate it by cooking on a medium high flame. 2. 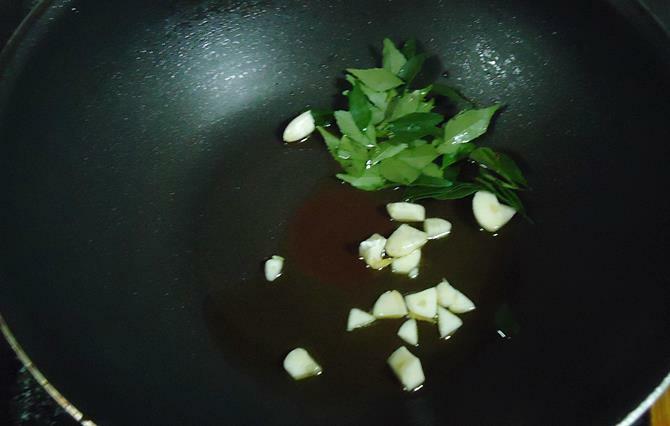 Add ghee to a pan, Fry curry leaves and garlic. set aside few curry leaves for garnish. 3. Add cooked chicken and fry till the masala dries up. 4. Sprinkle pepper powder and salt if needed to adjust. 5. Fry for about one to two minutes till you get a nice aroma of pepper, ghee and curry leaves. 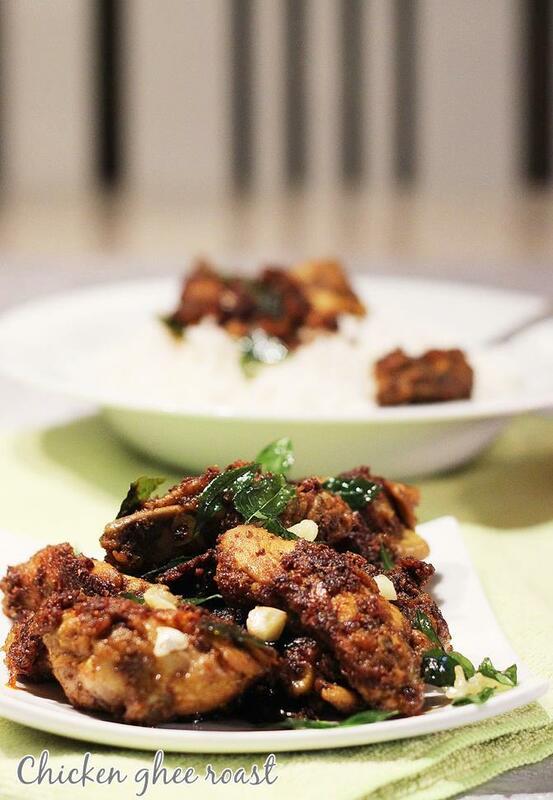 Garnish chicken ghee roast with curry leaves that were set aside. Great recipe.. came out very well..
Had to reduce the spices a bit though for our taste. But came out very well on the first attempt. Hi Swasti. I tried out this recipe. It came out really well. My kid of 3 yrs just loved this chicken ghee roast. So glad to know you liked it. It’s a favorite with my kids too. 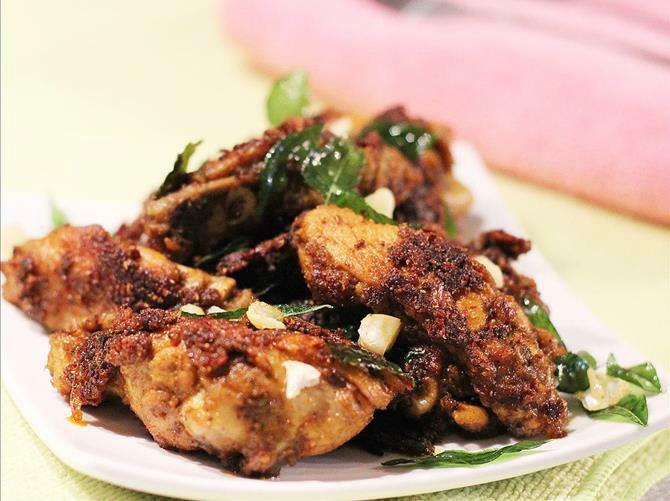 I love the taste of ghee roast chicken. But I think am going wrong somewhere. Thanks! I tried it again today, but I saw your comment later…and I’ve got I more doubt that I posted just now. Will check out the other recipe too. That sounds really interesting, delicious roast &amp; tempting pics! Ghee chicken roast, cant ask more..Droolworthy dish. chicken recipes are so mouthwatering in ur space.i love this .super super.